Current debates on media-performance relationship focus on the ability or inability of documentary materials (photographs, video, film, props, scores, scripts, reviews) to provide a true and authentic image of historical live performances. Another recent tendency in media-performance discourse is led by the belief to overcome the limits of mediated (second-hand) history via reenactments of historical performances. The investigation of live theatre/performance, by means of placing it into a relation with live forms of new media, results in diverse forms of output and mise-en-scenes. These new perspectives may lead us towards new, or renewed, and maybe unexpected claims about the ontological as well as historical status of both the theatre/performance and live media performance. The investigation of the relationships between live theatre/performances and live new media productions will be conducted experimentally by media artists Gívan Belá and Michal Kindernay, starting February 22. 2010 (and continuing later on) as a part of their ongoing project THE LAST THEATRE SHOW EVER! /The First Theatre show never! The subject of the work is the theatre adaptation of Franz Kafka’s Proces/Der Prozess by Dušan David Pařízek in Theatre Komedie (Divadlo Komedie) in Prague. Even though most of the current debates on the media and performance relationships regard performance art as an art field waiting for its integration into the official art history books, our project aims to protect live arts as radical and subversive media, resisting any effort to make them conform to official art history. This motivation is also reflected in the chosen subject. Kafka’s unfinished novel Der Prozess (1925) is a unique articulation of a minority member experience, whose voice functions as a noise-art-of-society. Noise as the articulation of the outsider's experience of the Order (and by the Order) will serve as a thematically corresponding back/playground for an experiment with subversive and often radical formats of live action combined with live media processing. While the documentary and realistic media for the representation of live performances are usually criticized for their mere fragmentary ability to record and represent the complexity of the live event, artists will use new media techniques to transfer the recording of live performances to the abstract realm of the computer. This enables them to process and perform the data taken from the live performance in a very complex, albeit non-representational way that refers to aspects of the theatre/performance, which goes beyond our retinal and aural experience. By using sensors and processing, they will audiovisualize the forces that animate some of the visible actions and to which all actual plays and performances (and, according to Hans-Georg Gadamer, even all art) refer. What can be thus dissociated from the representing activity of the players and consist in the pure appearance (Erscheinung) of what they are playing. As such, the play – even the unforeseen elements of improvisation - is in principle repeatable and hence permanent. It has the character of a work, of an ergon and not only of energeia. In this sense I call it a structure (Gebilde). What as such can be dissociated from the representing activity of the players, is still linked to representation. This linkage does not mean dependence, in the sense that the play would acquire a definite meaning through the particular persons representing it, apart from the real creator, the author. Rather, as a relation to them all, the play has an absolute autonomy, and that is what is suggested by the concept of transformation. Digital media will not be used in a way to accentuate the opposition between mediated and live performance. The experiment will rather accentuate and try to make visible the hidden activity of an omnipresent play in an effort to stimulate new aesthetic experiences. We can see the results of this approach and the reasons for its persistence in the effort of scholars to place theatre/performance outside contemporary mediatized culture’s economy of reproduction, and in the generally accepted understanding of live performances as the counterbalance of the dominant characteristics of contemporary visual culture. This approach is seen e.g. when Patrice Pavis describes influences of media on theatre performance as “technological and aesthetic contamination”. His words could stand for the ideal of the ‘pure form of theatre’ as the core of the discipline. We can deduce that the unmediatized experience of the notorious ´here and now´, fading away during a performance production (together with the live action of the actors' bodies) is generally accepted to be the main characteristic of the theatre/performance. Phelan’s definition of live theatre/performance betrays the higher evaluation of live experience over the mediatized one. Its roots can be found in the revolutionary atmosphere of the second avant-garde movement with its emphasis on live art forms, where the gesture was not only aesthetic, but also political one. Live art forms of the 60s and 70s should be seen as a part of the politically charged counterculture movement. This is manifested in the effort to liberate the artistic creativity from economic relationships. The artwork should be liberated from the system based on a commodity circulating in the loop consisting of curators, gallery owners, artwork owners, by means of a rejection of any possibility to reproduce the work of art/ist. Generally speaking, the media able to deal with certain experiences of live theatre/performances of the past are documentaries (most often photographs and videos) and memories of participants, which together with authors’ scripts can serve as scores for representations and reenactments. However, it is important to be aware of the limits of each medium. Probably the most discussed media for documenting live performances are photographs. The ideologically attributed transparencies of these media have several problematic sides. One of them stems from the fact that it cuts away the dimension of one of the fundamental qualities of live arts - time/movement - and the related qualities like timing, the dynamics of the performance and also sound, voice, etc. The other problem with photography is its double mode of representation. The photograph is seen on the one hand as a ‘pure’ document, indexically referring to the original event. On the other hand, the photographer often tries to transform the whole event into a single picture (or series of pictures), which serves as a metaphor and abbreviation. In this sense, it is not referring to the specific moment of the event that is recorded by the camera, but rather serves as an autonomous symbol – representing the whole performance. Performance with 120-volt electrical current, two wires. The photograph is a good example of the ambiguous relation between the action and its recording. On the one hand, it is an index - document referring to the very dangerous, death-defying action, in which the artist challenges a risky and violent potential of high voltage electricity. Although on the other hand, it is an autonomous image – a symbol or even an icon in the very literal sense of the word - functioning independently as an image. The rather technical description of the event, which Burden presents in the script above, proves that also the artist's own depiction of the performance should not be taken as an adequate medium of live event representation. The script is only its blueprint, not its recording. It should be taken not as an additional record of what was done, but as a score ready to be performed in new contexts if someone else finds it to be a proper medium for his own creative expression (as for example Kafka’s novels). His need to explain the situation in its complexity refers both to the fragmentary (documentary) and metaphorical (theatrical) quality of the photograph. He tries to overcome these limits of photographic representation by the explanation of other (mostly invisible) and thus unrepresentable circumstances and factors, which are missing in the image (like tension, sound, or the smell of burning skin). Shanken’s effort to complete the image of Burden’s risky action shows the importance of the testimony of witnesses as a medium of representation. But in order to avoid short endings, we should state that also recording eyewitnesses’ testimonies cannot be treated as a ‘truth’ about the event. The confrontation of assertions about any past event would show us how easily the perspectives and meanings can be ascribed to a situation and thus change it even radically. Kershaw expressed uncertainty of witnesses about their ability to reproduce the past event and even to verbalize their own experience of it. However, when we shift the perspective, we can see the law court where the trial takes part as a stage, on which the accused, victims, and witnesses perform their testimonies live. Philip Auslander took this perspective and argued for the similarity of live performance and legal procedure. Due to the system’s strong preference for live testimony, it is also covered in the law system as a proof of the past events. He showed with the support of many examples, that the live performance of memory retrieval, and the live confrontation of witnesses, accused, and victims in front of a jury is not only the praxis, on which the Anglo-Saxon judicial system is based, but proved that this practice functions also within the existing paradigm of the live performance (or vice versa?). The theatre/performance based on Kafka’s novel Der Prozess/Proces superposes the dominant theme of Kafka’s novel with the form of the live performance, which can be understood, according to Auslander’s statement about relationships between situation of performance and trial, as an actualization of a trial, conceived as a pattern of live performances/events in general. So we can see the theatre/performance Der Prozess/Proces as an exemplary representative of live performances in an even wider sense than the notion of performance arts delimitates. The director of the stage production, Dušan Pařízek, interprets the subject of Kafka’s novel not as a fight between the individual and the totalitarian system (this interpretation was brought into Czech theatre context by Jan Grossman’s famous stage production of Kafka’s The Trial in 1966), but goes deep into the structures of the writing process and situation of the presentation/confrontation of the result of the writing/creative process to/with the reader/audience. Thus, he transformed the whole situation of the theatre performance into the trial: The actor (Josef K./Martin Finger) is the witness in his own trial, giving evidence about his own life to the theatre audience, summoned to a position as the jury, judging his performance of the guiltiness of his life. The mise-en-scene of Der Prozess/Proces doesn’t represent pure theatrical form; rather, it is an example of the theatre production in Pavis’s words from the beginning of the article “contaminated” with media: There is a repeatedly used pre-recorded video and song Stand by me (by B. E. King, J. Libera, M. Stoller), which, playing from a cassette player placed on the stage, divides the stage production into montage of scenes. However, the main role among the media used in the stage production has a text, more accurately: the process of writing by hand as a process of giving self-examining testimony. This is the key to the stage interpretation of the novel. We can say that the “postproduction” of Kafka's novel does not add another layer upon the original text, rather, the stage production goes the opposite way - into the material the novel is made of and reveals the process of writing, in other words, the artistic creation is performed. The last reason to be mentioned for choosing the stage production Der Prozess/Proces as a central part of the experiment is the fact that the very stage production Der Prozess/Proces cannot be seen as an original work of art in a traditional sense of the word. The stage production itself is a result of the process of transformation of the novel (epic) into the form of drama and then into the 4D work of art – the stage production. We can say that the dramatization and stage production of Kafka’s novel is a typical example of the presently widely spreading artistic strategies of postproduction within culture of usage. The experiment explained afterwards will be the subject of investigation of the alternative possibilities of relationship between theatre/performance and (new) media. We will add new media with their immateriality, programmability, and performativity (and associated qualities) to the scope of analogue media forms (which we have discussed above). This makes the relationship between performance and media more complicated, but also more challenging. The experiment will examine this relationship via the live performance linking with the live digital media performance. The goal of the experiment is to search for new/other configurations of live performance and media. The digital media will be used neither as a tool of representation nor as a tool of reproduction during the experiment. The live performance linking with the media via its transformation from one state to another should not contaminate the performance. The project will deal with the liveness of live theatre/performances in the situation of its disappearing/transformation into memories of its participants and computer. We can say that the live performance’s presence via its disappearing will be the subject of the media transformation and postproduction/performance as well. If the analogue media world is typical for its fragmentation and inaccuracy, then the digital media world offers the maximum information to the interpreter, although in an incomprehensible language (like mathematics). So we can say that the complex and impenetrable information that digital recording provides, even enhances the main characteristic and quality of live theatre/performance via accentuation of its ontology of disappearance. The experiment with transformation of the theatre/performance into the different new media languages and spaces can be likened to the way digital media are used for simulations of complex phenomenon. We can collect data about them, we can simulate them, but we can’t represent/display them. All these means and media can help us only refer to them in different ways. So we decided to investigate the possibility escaping the hierarchical relationship of presence and representation and use the live performance-data as a source of material and imagination for making art. The post-document historiographic landscape is enframed by paradigms of information design and technologies of viewership, among them: interface, quantification of relevance and (subjective) informational hierarchies. The project we are going to introduce can thus be seen as a form of collaborative research, in which artistic and scientific approaches overlap and fuse. *1971. She completed her studies of Theory and History of Theatre at Charles University in Prague and Masaryk University in Brno (Mgr., Ph.D.). She works as a lecturer and guarantee of the Theory of interactive media studies (at Musicology dept., Faculty of Arts, Masaryk University). Her professional interests lay in point of intersection between art-science-technology with special attention to media-performance relationship and robotic art. She has published in Czech and foreign periodicals and publications. She has participated at Czech and international conference (She won the best paper award at EMCSR 2004 Vienna for her paper at history of science section). She has organized international symposia Media-Performance (2005, 2007). She (together with B. Buescher) is co-editor of Czech-German book Imaginary Spaces (2008). Soon will be published her first monograph Robot as a Robot (2010). The production opened the theatre season 2007/2008 in the Theatre Komedie. The Proces (Trial) was presented at the international theatre show PROJEKTION EUROPA at Deutsches Schauspielhaus, Hamburg, where Dušan D. Pařízek represented Czech Republic. The Proces (Trial) was rewarded with Alfred Radok award for the best stage production of the year 2007. Martin Finger (Josef K.) gained Alfred Radok award in male actor performance category. Divadelní noviny magazine priced the Proces the stage production of the year 2007. 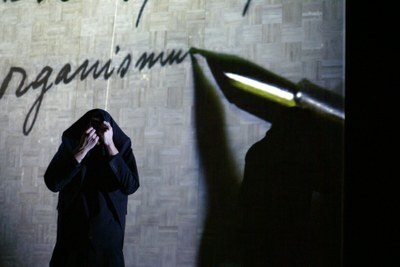 The Proces production got MAX price for the best production of text originally written in German in Czech Republic in the season 2006/2007 (awarded by Cultural foundation Allianz and Prague theatre festival of German language). Gadamer, Hans-Georg. Truth and Method. Great Britain: Continuum Publishing Group. 1975/2004, p.110. Pavis, Patrice. Theatre and the Media: Specificity and Interference. Theatre at the Crossroads of Culture. Trans. Loren Kruger. London. New York, Routledge, 1992, 99-135, p. 134. Phelan, Peggy. Unmarked: The Politics of Performance. London, New York: Routledge, 1993, p. 146. Auslander, Philip. Ontology vs. History: Making Distinctions Between the Live and the Mediatized. Conference paper: 3rd Annual Performance Studies Conference. Atlanta. 1997. on-line: http://webcast.gatech.edu/papers/arch/Auslander.html (rev. February-7-2010). Baudrillard, Jean. Simulations. Trans. P. Foss, P. Patton, P. Beitchman. New York: Semiotext(e), 1983, p.146. in Auslander, reference number 6. We understand liveness as the sense of living presence. It always involves action in the present, an awareness of now. (see http://www.liveness.org/) . While above quoted Auslander has a broader understanding of the term. See his book: Liveness. Performance in Mediated Culture. London and New York: Routledge. 1999. Philip Auslander differs between documentary and theatrical photographs in Auslander, Philip: The Performativity of Performance Documentation. Performance Art Journal, no. 84, 2006, p.1-10. The image and the text are published e.g. in Art and Electronic Media. ed. Shanken, E. 2009, p. 145. Kershaw, Bay: The Radical in Performance. Between Brecht and Baudrillard. Great Britain: Routledge, 1999/2002, p. 157-159. Auslander, Philip. Liveness. Performance in a Mediated Culture. chapter: LEGALY LIVE. Law, performance, memory (pp.112). London and New York: Routledge. 1999.